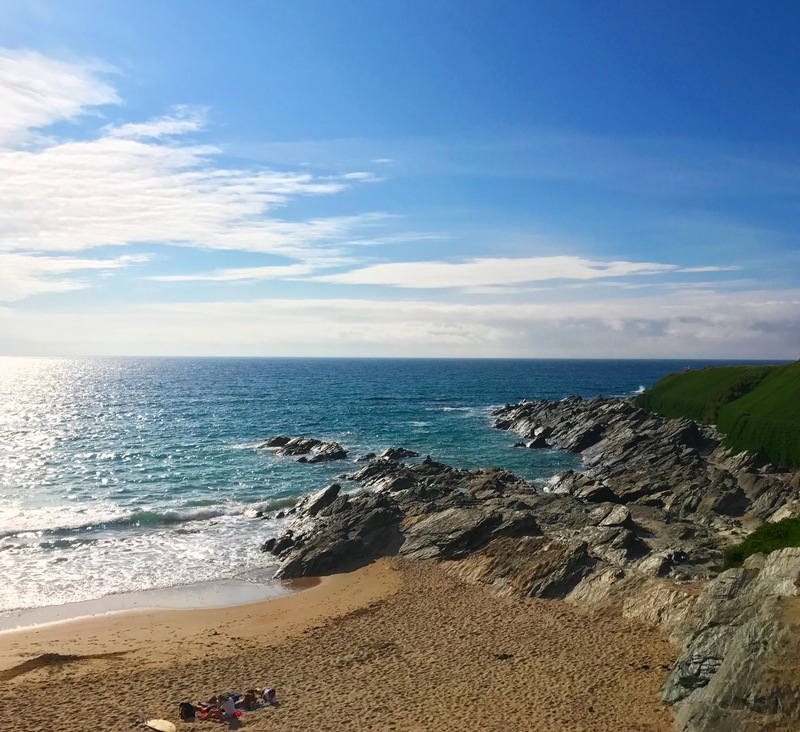 Home annually to Boardmasters festival and the perfect place to catch a wave on the Cornish coast, the beautiful cove of Fistral Bay is a famous little hideaway for locals and tourists to the town of Newquay. On the sandy seafront, there is a collection of eateries, including ‘The Stable Bar’. As if you’re at sea on a Cornish ship, the bar opens up to a picturesque, panoramic 180′ window over the big blue ocean. Stepping out on the balcony is just like stepping out onto the sand, with the glissening waves just metres away. The bar is a perfect surfers retreat, or the perfect beginning to a glam Friday night. The pub is branded ‘Pizza, pies, cider’ – and that’s what exactly is on offer. Whilst the menu is small, it does not compromise on flavour. The rustic wunderwar vibes with an edge of surfers chić make the atmosphere totally laid back and relaxed, to mute the busy, busy service bustling on around. 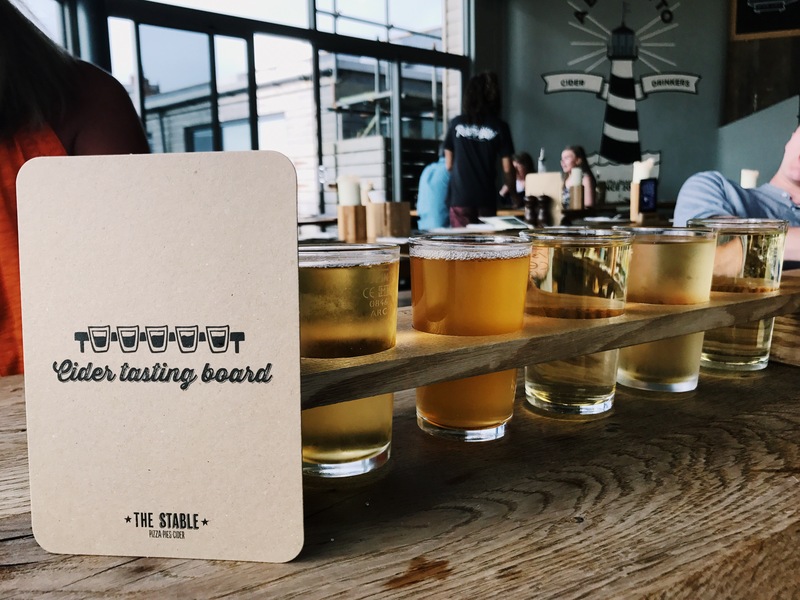 We first started off with a ‘Cider tasting board’. For just £7.50, you get a taste of the bars recommended Cornish brews, starting from the sharp and tangy to the soft and sweet. I found this a really cute idea, and definitely tempted you to buy a pint of the whole thing. However already being provided a 1/3 pint of each booze beverage, we were quite satisfied after our tasting board alone. I’m definitely one for a savoury taste tingling cider! Next, we went in for the munch and started with, well, a starter. Sadly, there was little options to open the meal, but we went for the four persons Cornish cheese and meat cracker platter. And I have to say, the tomato chutney and blue Stilton were to die for! 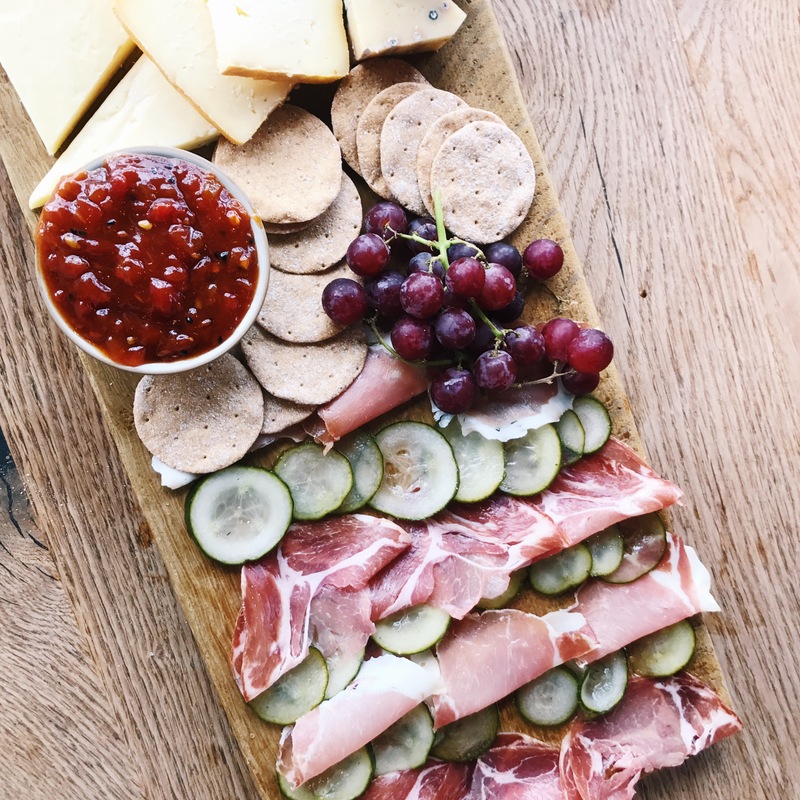 The board also featured sourdough crackers, cured ham, pickled cucumbers and juicy red grapes. This would be a perfect start or end to the meal, but it is on the pricey side at £24. But I mean, you’re paying for that, regional produce AND savouring it all over a perfect coastal view? Not bad really! Now it was time for the main. Pies, pizzas and salads were on offer, all uniquely named with not just your standard pub ingredients. And amazingly, there was a huge vegan menu to choice from with quite frankly, looked divine (if I wasn’t sharing with my vegan phobic fam, I would of 100% would have picked one of the amazing veggie options!). Topped with fresh seafood, slow cooked meats and all your fave cheeses, the pizzas were divine. I had some of the chicken and veg pizza which was delicious! That bases were so crispy thin and light, but surprisingly filled; it made the perfect light dining dish. Although we didn’t opt for the pies, we were eyeing them up as they travelled from the kitchen to the tables. They were HUGE and hearty, served alongside what appeared to be a salad of variety and colour (which also looked delectable nevertheless). Desserts and coffees were also on offer to finish the meal, alongside a full range of drinks and home coast ciders – a perfect end to a Cornish feast. This was just a delightful meal with incredible views, which I highly recommend to any visitors to Newquay. 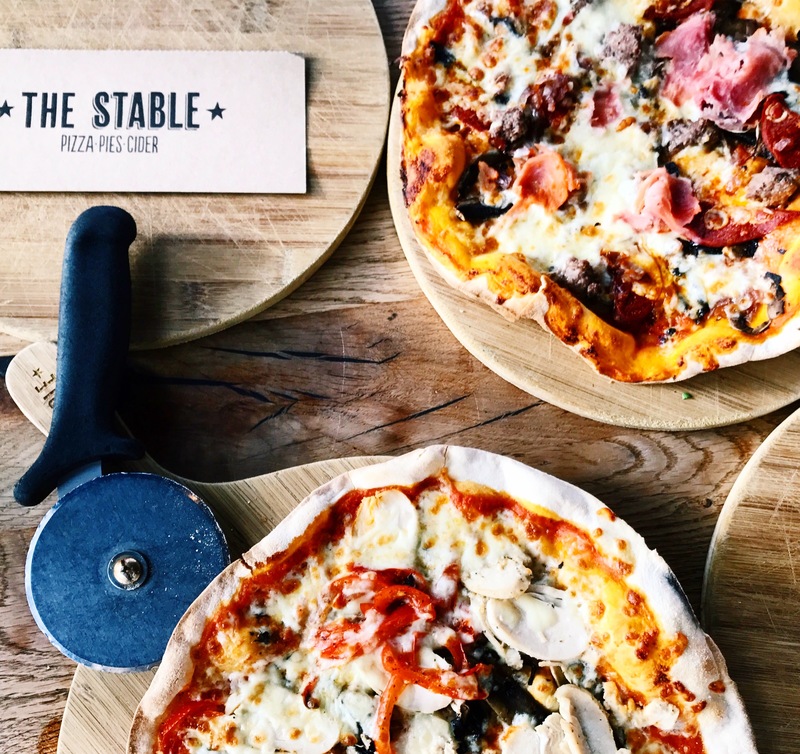 If you’d like to visit or have a peak for yourself, ‘The Stable Bar’ can be found at http://stablepizza.com/locations/the-stable-fistral-beach/ – you can also find a full list of other locations in the U.K where this wonderful restaurant serves it’s delights (but I’m sure you’d struggle to get quite as a tranquil view).